Use of potent antiplatelet drugs requires evaluation of platelet function. While platelet function in elective cases is usually assessed in a central laboratory environment, there is also an urgent need for rapid perioperative point-of-care assessment. Recently, multiple electrode platelet aggregometry has been developed and assumed to measure platelet function independent from platelet count. We tested the hypothesis that results of multiple electrode platelet aggregometry are affected by platelet count, in particular if platelet count is below normal range. Whole blood samples from 20 healthy volunteers were prepared containing platelet concentrations of 50,000, 100,000, 150,000, 200,000, and 250,000 μl-1 while maintaining hematocrit. Platelet aggregation was induced by collagen, thrombin receptor activating peptide 6 (TRAP-6), adenosine-diphoshate (ADP), and arachidonic acid, respectively, and aggregation was measured by multiple electrode platelet aggregometry (Multiplate™). 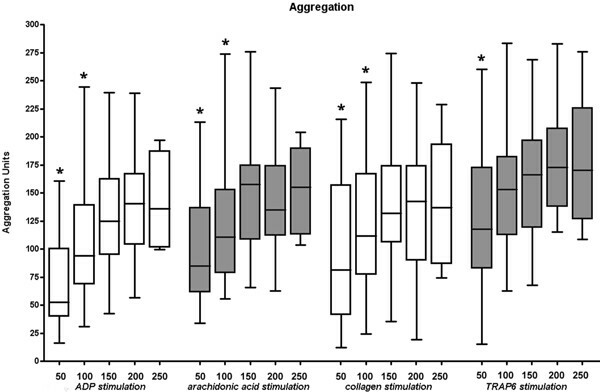 Results of multiple electrode platelet aggregometry significantly decreased in blood samples with platelet count below normal range. Compared to results measured in blood samples with platelet count within normal range, aggregometry results decreased by 18.4% (p < 0.001) and 37.2% (p < 0.001) in blood samples with a platelet count of 100.000 and 50.000 μl-1, respectively. On the other hand, large interindividual variation has been observed and some blood samples showed normal results even with platelet counts of 50.000 μl-1. The results obtained with Multiplate™ Analyzer are influenced by platelet function as well as platelet count thus displaying the overall platelet aggregability within the blood sample rather than platelet function alone. Intensified and combined antiplatelet therapy in cardiology and cardiovascular surgery as well as peri-operative disturbances of haemostasis implicate the need for rapid peri-operative monitoring of platelet function [1–3]. Classical methods for assessment of platelet function, such as Born aggregometry or flow cytometry are time consuming and require preanalytical processing of the blood sample. Therefore, they are harbored in central laboratory environments and are of little use during anaesthesia and surgery. Recently, multiple electrode platelet aggregometry has been introduced and recommended for point-of-care (POC) testing of platelet function . Based on impedance aggregometry, first described by Cardinal and Flower , the multiple electrode platelet aggregometry (Multiplate™ Analyzer, Dynabyte medical, Munich, Germany) [6, 7] acts by measuring the time-related increase of impedance between two electrodes as a result of platelet aggregation on the electrodes following pharmacological activation. Toth et al. evaluated this method in blood samples with a platelet count within normal range and reported reliable detection of platelet inhibition evoked by different agents . However, during major surgery, e.g., liver transplantation or cardiaovascular surgery, platelet dysfunction and thrombocytopenia often coexist requiring assessment of platelet function. Accordingly, we tested the null hypothesis that results of impedance aggregometry obtained by Multi-pate™ Analyzer are not influenced by platelet count. The study was approved by the local ethic committee and all subjects gave their written informed consent before participation. Twenty healthy volunteers (13 male, 7 female) of caucasian origin without haemostatic disorders and free of medication were recruited from students and faculty. Venous blood was collected into heparinized tubes (Sarsted AG & Co, Nümbrecht, Germany) via a large diameter cannula (0.9 mm ID) inserted into a cubital vein. Platelet count, haemoglobin concentration, and haematocrit were measured by an automated hematology analyzer (Sysmex mo. KX-21N, Norderstedt, Germany) (normal range of platelet count: 150,000300,000 μl-1). To obtain blood samples with adjusted platelet count without change in haematocrit, half of the originally sampled blood volume was centrifuged at 2500 g for 15 min. Afterwards plasma and red blood cells were separated and platelet rich buffy coat was discarded. Red blood cells and platelet poor plasma were then remixed at primary haematocrit to serve as platelet poor blood for subsequent dilutional steps. Native blood was then mixed with platelet poor blood to adjust blood samples to platelet counts of 50,000, 100,000, 150,000, 200,000, and 250,000 μl-1, respectively. Due to variations in platelet count in our healthy volunteers platelet concentrations of 200,000 and 250,000 μl-1 were not achieved in all individuals (50,000, 100,000, and 150,000 μl-1: n = 20; 200,000 μl-1: n = 16; 250,000 μl-1: n = 6). Platelet aggregation was measured by Multiplate™ analyzer (Dynabyte, Munich, Germany) following activation with commercially available standard reagents (Dynabyte, Munich, Germany). To test different pathways of platelet aggregation and their potential dependence on platelet count, aggregation was stimulated 1) via adenosine-diphosphate (ADP) receptors by ADP (ADP-Test), 2) by arachidonic acid, the substrate of cyclooxygenase (COX), which subsequently forms the potent platelet activator thromboxane A2 (TXA2) (ASPI-Test), 3) by collagen via the collagen receptor, which leads to a release of endogenous arachidonic acid and TXA2 (COL-Test), and 4) by TRAP-6 (thrombin receptor activating peptide 6) via the thrombin receptor on the platelets' surface (TRAP-Test). After platelet activation Multiplate™ analyzer records impedance between two electrodes during a period of six minutes reflecting platelet aggregation on the surface of the electrodes. The measuring cell contains two pairs of electrodes to serve as an internal control. Results are displayed as amplitude-time-curves over six minutes assessing the following variables: velocity of aggregation (VEL, the maximum slope of the curve), maximum aggregation (AGGR, the maximum amplitude of the curve), and, most important, the area under the curve (AUC). AUC is affected by both velocity and maximum aggregation and is considered as the best parameter to reflect overall platelet aggregation [6, 7]. AUC is CE labelled and usually the main variable used for treatment decisions while velocity and maximum aggregation are used for research only. A typical tracing is displayed in Figure 1. Reference ranges for AUC are displayed in Figure 2. Example of a platelet aggregation curve. Note that the two aggregation curves which represent two parallel measurements are almost superimposable. 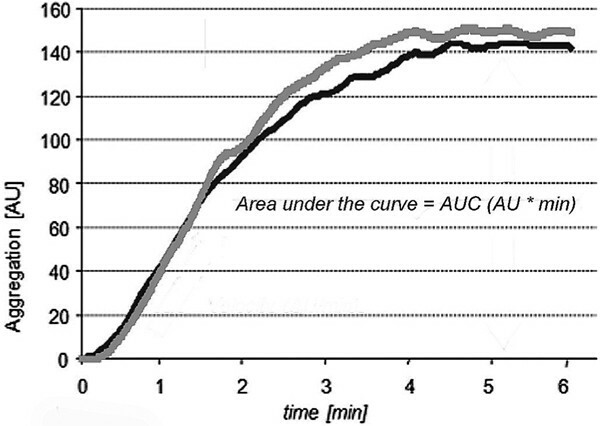 The most important parameter for aggregation is the area under the aggregation curve (AUC). Platelet aggregation area under the curve depends on platelet count. Results show a significant decrease in aggregation with a platelet count below 150,000 μl-1, irrespective of stimulant. Reference ranges for each activator are highlighted by light grey boxes. *are assigned with statistically significant different results as compared to the lower end of normal range (150,000 μl-1). Data are expressed as means (± standard deviation, SD) or boxplots. for statistical analysis the statistical Package for social sciences (SPSS for Windows, 13.0, SPSS Inc., chicago, Il., USA) and graphPad Prism (Version 4.02, graphPad software Inc., san diego, CA., USA) were used. data were positively tested for normal distribution and then analyzed using repeated measures analysis of variance followed by a paired ttest with bonferroni correction. an α-error p below 0.05/n was considered to be statistically significant. Compared to the minimum value of normal platelet count (150,000 μl-1) significantly decreased AUC results were detected in blood samples with a platelet count of 50,000 μl-1 for all activators (ADP, ASPI, COL, TRAP). Furthermore, ADP, ASPI, and COL stimulation in blood samples with a platelet count of 100,000 μl-1 also yielded diminished aggregation. no differences in auc were found in blood samples with different platelet counts within the normal range with all activators (Figure 2). The same results were obtained for aggregation velocity. Compared to the minimum value of normal plate let count (150,000 μl-1) at a platelet count of 50,000 μl-1 significantly decreased results in aggregation velocity were measured for all stimulants (ADP, ASPI, COL, TRAP). In addition, aggregation velocity after activation with ADP, ASPI, and COL was also reduced at a platelet count of 100,000 μl-1. 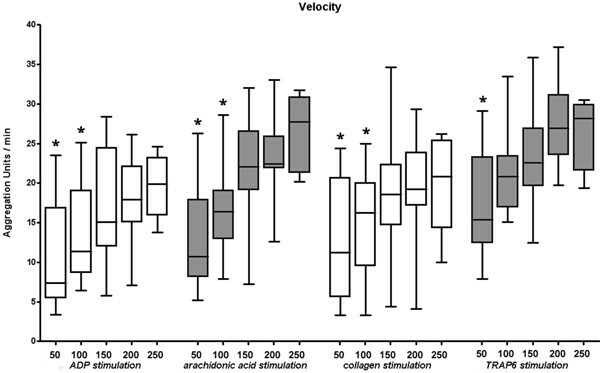 No differences in aggregation velocity were found within the normal range of platelet count for all stimulants (Figure 3). Percentage of measurements within the normal reference range with the absolute number of measurements given in brackets. Velocity of platelet aggregation depends on platelet count. Results show a significant decrease in aggregation velocity with a platelet concentration below 150,000 μl-1 irrespective. * are assigned with statistically significant different results as compared to the lower end of normal range (150,000 μl-1). By the same token, compared to the minimum value of normal platelet count (150,000 μl-1) at a platelet count of 50.000 μl-1 significantly decreased results in maximum aggregation were detected for all stimulants (ADP, ASPI, COL, TRAP). This could also be shown for ADP, ASPI, and COL activation at a platelet concentration of 100,000 μl-1. No differences in maximum aggregation were found within the normal range of platelet count for all stimulants (Figure 4). Maximum platelet aggregation depends on platelet count. Results show a significant decrease in maximum aggregation with a platelet concentration below 150,000 μl-1, irrespective of the stimulant. * are assigned with statistically significant different results as compared to the lower end of normal range (150,000 μl-1). Avoidance of unneccessary blood transfusion and reduction of transfusion requirements are of great importance to minimize transfusion related adverse events [8–11]. In most hospitals, intraoperative platelet diagnostics are limited to platelet count, and efficacy of platelet transfusion is assessed by an increase in platelet count and "dryness" of the surgical field [1–3]. However, in patients with antiplatelet therapy after percutaneous coronary artery interventions or chronic medication with antiplatelet drugs platelet count is within the normal range whereas platelet function is compromised. Standard laboratory coagulation parameters do not predict increased perioperative bleeding in these patients . Furthermore, there is evidence that platelet function is impaired by major surgery, e.g., during cardiopulmonary bypass [13, 14]. Accordingly, there is a need for peri-operative point of care (POC) platelet function testing to guide therapy in order to reduce transfusion requirements, transfusion associated adverse events, and costs [4, 7, 15–21]. Multiple electrode platelet aggregometry is one of the most recently developed methods for POC measurement of platelet function [6, 7]. Toth et al. reported in their publication that results obtained by the Multiplate™ Analyzer reflect platelet inhibition induced by different agents and that these results were independent of platelet count . However, all subjects involved in this study had a platelet count within the normal range between 150,000 and 400,000 μl-1. Therefore, independence from platelet count of results obtained by this POC method has not really been tested in this study. Moreover, our study shows clearly that results obtained by impedance aggregometry are influenced significantly by platelet count in case of values below the normal range of 150,000 μl-1 independent from the used platelet activator. Contrary to other platelet function tests such as Born aggregometry, which uses platelet rich plasma, Multiplate™ Analyzer, as a POC device, assesses whole blood. In our study, we maintained hematocrit in all analysed blood samples at the same level by adding platelet poor blood instead of plasma. Accordingly, our results should not be influenced by different concentrations of coagulation factors and cellular blood elements besides platelets. Furthermore, other platelet function tests like Born aggregometry or platelet function analyzer PFA100™ (Dade-Behring, Marburg, Germany) require an adjustment of platelet count on 100,000 μl-1 or at least a platelet count above 100.000 μl-1. Since the Multiplate™ device analyses platelet function in whole blood without adjustment of platelet count it seems obvious that a marked decrease of platelet count results in a slower and less dense occupation of sensor wires. This leads to a reduced aggregation velocity and maximum aggregation as well. Since the AUC is dependent on both, velocity and maximum aggregation, a decrease of platelet count will also decrease AUC. Our results show that measurements using commercially available activators (COLtest, ADPtest, AS-PItest, TRAPtest) were all influenced by platelet count in case of values below 150,000 μl-1. Of note, however, due to interindividual differences in platelet aggregation, 44% of all tested samples yielded normal results for platelet aggregation with the Multiplate™ device even in case of platelet counts of 100,000 μl-1 and in 33% of blood samples with a platelet count of 50.000 μl-1. On the other hand, 28% of the blood samples yielded an AUC below the normal Multi-plate™ reference range, despite a normal platelet count. Thus, results obtained by the Multiplate™ Analyzer are dependend on both, platelet count and platelet function. In a peri-operative setting Multiplate™ Analyzer is used to assess overall platelet aggregability as a point-of-care method. 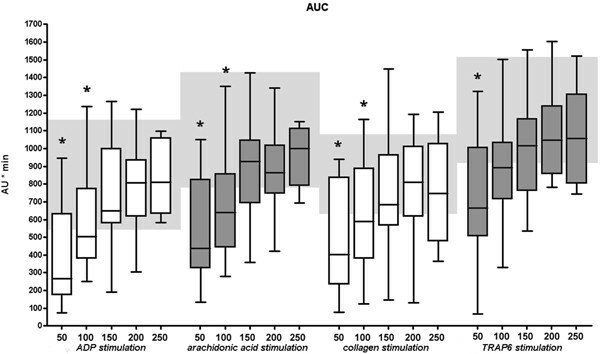 Therefore, AUC values below the normal range in the presence of non-surgical bleeding may be an indicator of decreased platelet aggregability regardless of whether due to a low platelet count or impaired platelet function [4, 22]. On the other hand, normal aggregation values as shown by the Multi-plate™ device may avoid transfusion of platelets even in the presence of a low platelet count. However, a predictive value of results obtained from the Multi-plate™ device on transfusion requirements was demonstrated by Rahe-Meyer et al. in a clinical setting during and after open heart surgery . Another purpose of the Multiplate™ analyzer is the differentiation of effects from several antiplatelet drugs by analyzing different pathways of platelet activation. Nevertheless, in the present study we tested untreated platelets only and thus did not test whether the Mutiplate™ device can provide such information in patients with a decreased platelet count. In conclusion, the results obtained with the Multi-plate™ Analyzer are dependent on platelet count and function with decreased aggregation at platelet concentrations of 100.000 μl-1 or below and Multiplate™ results are only dependent on platelet function in case of platelet count is within the normal range.